You likely know that our family (James, Janelle and teen sons Anthony and Caleb) cycled from Amsterdam to Paris the Summer of 2009. We then lived in Florence, Italy, for the school year (2009/10). During this year abroad our mode of transportation was by foot or bike---with the occasional rented car for weekend excursions. We stayed in quite a few inns, home stays, agriturismo's and European hotels. I loved staying at agriturismos, especially where they cook you both breakfast and dinner. One of the most memorable was in southern Tuscany. I went back a few times, including once just to cook with Gina. Glen & Sandy traveled Europe and enjoyed small inns and unique experiences. They took the best of those experiences and angled to re-create a 'European' flavored stay right in Oregon. We enjoyed breakfast and dinner, conversation with guests, and a makeshift soaking tub (outdoor tub solar-heated to about 95 degrees - a good soak after a long bike ride). 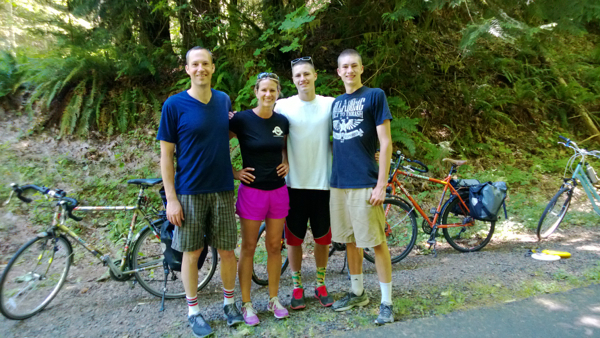 After our stay, Glen drove us plus bikes back to Vernonia (about 10 miles - they frequently and gladly transport guests to and from), where we [again] hopped the Banks-Vernonia trail. *trip sponsored by Oregon's Washington County; my experiences, photos and opinions are my own.